Welcome to our Gordon Setter webring. This webring is open to all fanciers of the Gordon Setter. We only accept websites of responsible Gordon Setter owners, lovers, and reputable breeders. 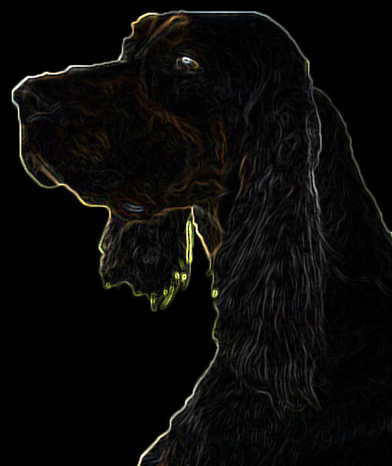 All breeders listed in this webring must be members in good standing with their local or national breed club (i.e., Gordon Setter Club of America, Gordon Setter Club of Canada, etc.) Breeders listed here will either have field or hunting Gordon Setter puppies, or Champion bloodline show Gordon Setter puppies for sale (or both!) Some breeders may have mature Gordon Setters for sale as well. Contact each breeder to see what they have available. We do not accept spam sites or puppy mill sites. All members of this webring have been screened to be sure that they are in compliance to these terms. The websites in this webring may include breeders, owners or individuals with items for sale pertaining to the Gordon Setter breed. All members of this webring have been screened. No puppy mill sites are allowed. We are a member of the best webring system available on the internet, using PERL script. Our webring is truly functional as compared to some other webrings that misdirect traffic to the Webring system's spam sites instead of to the next site in the webring (Where the owners of the webring system earn big $ bucks $ through "pay for click" from the ads on the ring's hub page - you should beware of any webring system that displays google adsense ads on the webrings hub page!) In some webring systems, If the ringmaster should discover the "click fraud" system of misdirecting traffic in their webrings, the system owners will engage in a hostile take over of your webring! If the ringmaster attempts to "close" their webring, the system owners will take control of their webring and continue to operate them! Talk about identity theft! The aim of this webring is to increase hits to your website through a functional, honest webring system. Our webring does not misdirect the rings traffic to the owners websites but to your website as it is listed in the directory of websites on the webrings list page, without any ads. Click the link below and simply fill in the form. Your Site Title should be the name of your website or blog. The Description should describe your site or blog, and any Keywords to help identify your site to search engines. The Site Entry is the URL of your website's homepage, or your Blog. The HTML code URL should be the URL of this page, or the page you intend to place the code on (this code will be sent to you via email, and should be cut and pasted here). Once you've pasted the code on your website, it should appear as the box at the bottom of this page. Your Site ID should be a unique word to you or your site, and your password something you've never used before. The Webmaster Name should be you, if you maintain your own site, or the name of the individual who maintains your website for you, and the Email to reach them. The contents of this website is copyright 2007-2017, Chuck & Heidi Moon (Moonsetter Gordon Setters). All rights reserved. No contents of this site, including photos, may be used or taken without the express written permission of Chuck & Heidi Moon.